Hello March Madness Survivor Pool players. 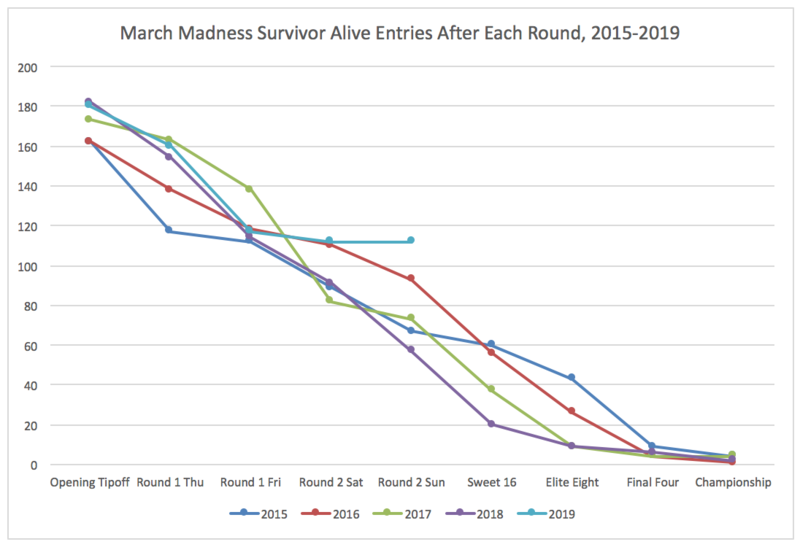 Here is hoping you enjoyed last weekend's basketball action - even if there was less "Madness" than usual (see graph). Are you geared up for this weekend, starting tonight? 1. You need one pick for Sweet 16 round, not one pick Thursday and one pick Friday. However, the pick must be input before opening tipoff of the first game this round, which is tonight (Thursday) at 7:09pm Eastern, Florida State vs. Gonzaga. 2. The Elite Eight schedule will not be input in the website until after all Sweet 16 round games are final, so that will be late (late) Sunday. I better take an afternoon nap. 3. You need one pick for Elite Eight round. That pick must be input before opening tipoff of the first game of the round, which should be about 6:00pm Eastern. So, get your pick in for Sweet 16 if you haven't already, and be at the ready after you get the Sweet 16 game right (right?) to make your Elite Eight pick Saturday. Got it? Great. Now go plan your picks accordingly even though apparently it is favourites all the way this year. Anyone picking Duke this round, hmm...?